So here we are again on this foreign lake. We seem to be plagued by S or SW winds, the worst possible. Our marker buoys have been mucked up by the recent gales so much that the only course would be a slalom! Unfortunately we didn’t have an Olympic hammer thrower to put some markers in better positions but there was a friendly kayak-er on the lake and he obliged by re-positioning a marker to allow us a reasonable course with a short initial beat. The DF65s were first up. Although A rigs were the order of the day some of the markers caused many a disaster, except to the ‘expert’ sailors, (how do they do it?) so there were no surprises in the results other than Tim lost one race to Garry!! Thanks to Eric Reid for scoring for us. 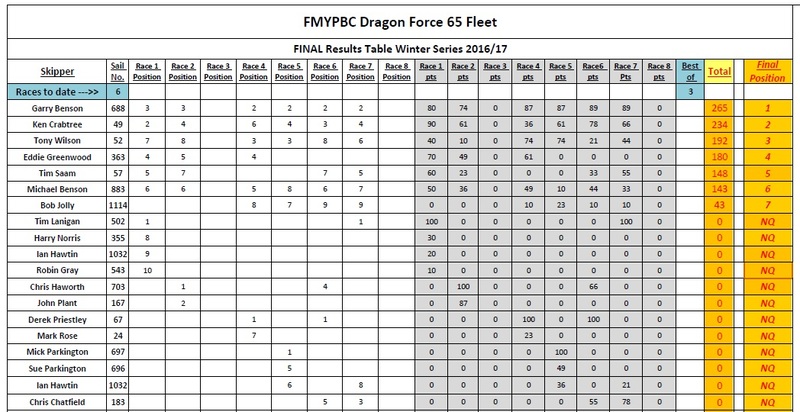 The day’s results are below together with the final league table for the DF65s winter series. Next up the DF95s captained by Garry. Being second up we fortunately benefited from the prior 65 racing and also from Bob Jolly for taking on the RO duties. Yet again the 95 offered a maiden race to Peter Chester who just fell short with a second to Tim Lanigan’s first of six bullets. PS Don’t forget the DF TT on March 25th/26th!! 65s on the Saturday, 95s on the Sunday. If you are going to race please register on-line; it gives us an idea of how many to cater for.